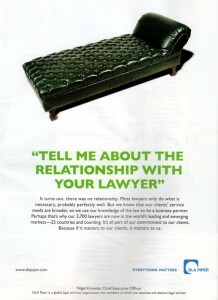 "TELL ME ABOUT THE RELATIONSHIP WITH YOUR LAWYER"
It turns out, there was no relationship. Most lawyers only do what is necessary, probably perfectly well. 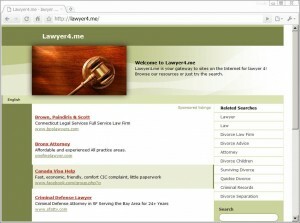 But we know that our clients' service needs are broader, so we use our knowledge of the law to be a business partner. Perhaps that's why our 3,700 lawyers are now in the world's leading and emerging markets — 25 countries and counting. It's all part of our commitment to our clients. Because if it matters to our clients, it matters to us. It may take a while to build this brand, which is, let's agree, very difficult to remember. Why wouldn't they go with something jinglier? Something easier for the eyes? On the other hand, legal guys know little about marketing. E.g., Diana Salem has advertised her services on lawyer4.me through AdWords and then forwards to her facebook page International living and Immigration. So, a good thing to learn - is to trust marketeers when it comes to branding.